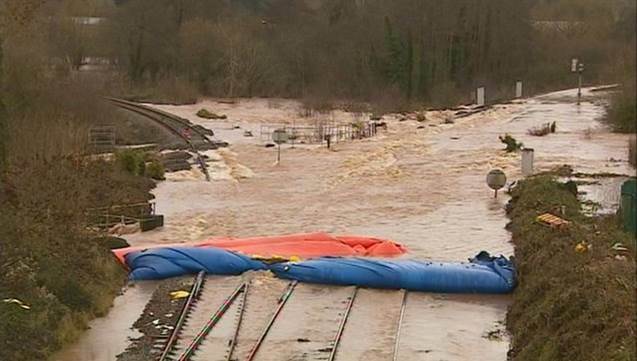 Network Rail has announced its preferred solution for tackling the problem of continual flooding at Cowley and Stafford bridges in Exeter. This solution involves the removal of three weirs close to the bridges to lower the water level in this part of the River Exe. Flooding at these bridges is a long-standing problem that has had a devastating impact on the nearby railway line and on the local community. In total, it has resulted in four weeks of disruption over the last two years, meaning numerous delays and closures on this part of the Great Western Main Line; loss of profit for businesses in the area; and a huge inconvenience to local residents. Over the last year, Network Rail has been working to find a long-term solution to these problems. This has involved undertaking an in-depth environmental study of the area to establish the cause of the flooding and an assessment of the options available to reduce the chances of it happening again. The solution of removing Pynes, Exwick and Cowley weirs was chosen as the most preferable because it would provide the highest return on investment when the extent to which it could prevent further flooding was compared to its cost. Once the three weirs are removed, the river will be returned to its natural state, meaning that in this part the water level will fall by up to a metre. BRITISH BUS BUGLE: Council Check: Cornwall Council Each week, we investigate the public transport information provision of one of our local transport authorities. Today, it's the turn of Cornwall Council. DENNIS BASFORD: ‘Scene’ and Sampled on a day out. The Neoplan Starliner The view from the front seats is stunning. The ride superb, it is powerful, quick, quiet and very comfortable. Everything a coach should be. NORWICH BUSES: New BorderBus Addition An early Enviro300 in the shape of KX54NKH has been delivered to the yard in dealer white colours with BorderBus logos on top Out and about around Fakenham Fakenham is home to one of three Sanders depots, unfortunately, all the vehicles were parked facing the fence this morning, so photographs were out of the question, however, in attendance were seven vehicles, including two Scania Omnicitys, two Plaxton Cheetahs, a former Neaves Plaxton Premiere, a withdrawn VanHool Alizee and a Black Diamond liveried Wright Cadet. PUBLIC TRANSPORT EXPERIENCE: First, First Good News Happy Birthday Star Bus operator First Hampshire celebrated the first birthday of its Star services on Monday (20 October) with the news that in their first year of operation, the Star buses have carried more than three million passengers. This represents a 12 per cent rise in passenger numbers over the year. The Case of the Confusing Combinations  ... ... or How NOT to Publicise Revised Services Here, from "Service Changes" is a sample of Arriva's helpful and potentially award winning policy of "Putting Passengers First". ANDYS BUS BLOG: Looking back... A coach park by the sea e are taking another trip back to the seventies where our regular correspondent David Bell shares a selection of photographs he took at Hunstanton coach park towards the end of that decade. SOUTHAMPTON UPDATE: Freebies on route 66 / Bluestar Xmas times In addition, local journeys within Romsey are free at all times from 2nd to 8th November inclusive. Quite what counts as "within Romsey" is not specified, so you'll need to ask Stagecoach about that one.